Recently one customer complain that the metal dome force changed so much after assembly on PCB. The metal dome used was “X6T-350-0.8*3.0”(A Triangle dome, Diameter 6mm, force 350gf, leg: 0.8*3.0mm). Before assembly, force is in normal force range 350gf, but after assembly on PCB, force change to about 500gf and then make whole dome key hard to press. 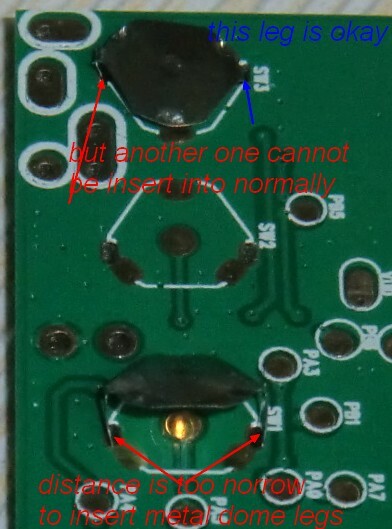 After saw customer’s PCB samples, we understand why this happened. Method is okay, but the problem was related with PCB design of customer. For Diameter 6mm triangle metal dome, the distance between two legs is 6.0mm, tolerance +/-0.2mm, so the tooling hole on PCB should be designed following that value. 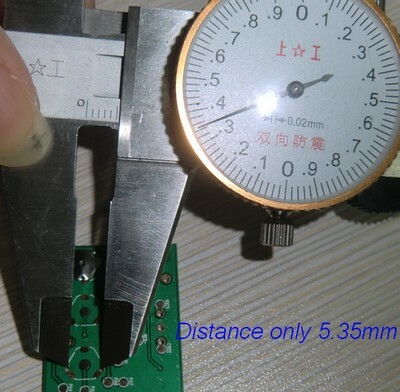 But when we measure the PCB, the distance between holes on PCB is only5.35mm. You can see a picture bellowing. Because hole distance on PCB is too narrow, so it’s difficult to insert leg of metal dome into the PCB. You can see when put metal dome on the PCB holes, it will not go into the holes, but remain above the PCB. When you press metal dome and leg can be inserted into the hole, but only one leg is properly installed, another one was shifted. You can see the red arrow. When press metal dome, people have to add extra force to bend the edge metal dome toward to center, to make the diameter from current6.0mmto5.35mm, so that end of metal dome leg will be on the same level of PCB. That extra force will be at least 150gf, so final metal dome force become 500gf (350gf+150gf). This is the reason why metal dome force altered so much between before and after assembly. After realizing the problem, customer re-designs PCB and problem solved. Metal dome force keeps the same before and after assembly on PCB. Just remember to have the same hole distance like metal dome diameter. 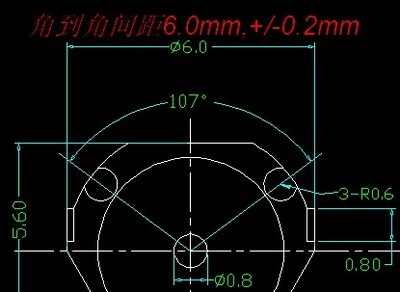 If dome used is6mm, then distance6.0mm, for8mm, use8.0mmhole distance. If you are not sure about that, please contact us before you design the PCB. We will be glad to provide service. This entry was posted in Metal Dome Assembly, metal dome related, Metal Domes, Triangle metal dome and tagged metal dome assembly, triangle metal dome. Bookmark the permalink.